This YBM Plastic Fine Mesh Strainer is the perfect tool for quick and easy straining. Use it to separate the seeds from freshly-squeezed lemon and lime juice or to strain tea leaves or mulling spices from brewed beverages. It features fine mesh for thorough straining . This Ybm Home Tea Strainer will not retain tastes, odors and will not impart flavors on foods. 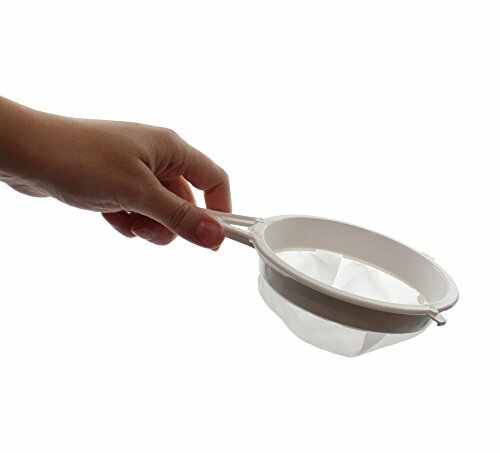 The convenient mesh strainer has many kitchen and household uses. Unique handles on sides of strainer allows the strainer to hook on the side of a pot or bowl to hold the strainer in place while straining - perfect for mess free straining and one handed use. Leave the strainer to dry on the wall by using the hook that is attached to the strainer. Let it simply hang there until your next kitchen adventure.